Kong is back, and the beast has never been this vicious. Since the 1933 classic, King Kong, the cinematic variations on the creature have been as varied as they are impressively crafted by the film world's latest technology. The stories surrounding humans trekking to his home, Skull Island, have twirled about similar predicaments, though: they venture to the island, encounter the impressive Kong, kidnap him for display in the world of man. 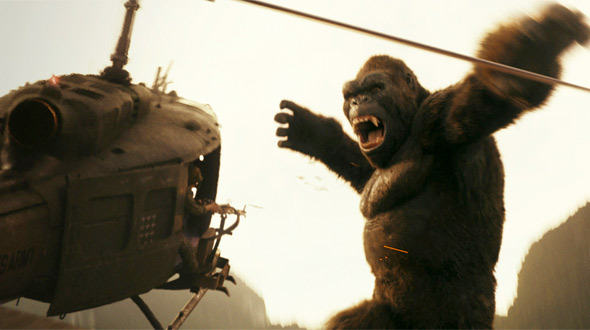 The giant ape deserves a shot of adrenaline, and it's director Jordan Vogt-Roberts who has come in to deliver that shot. Kong: Skull Island is a thrilling entry into the storied franchise and not only in expected ways. 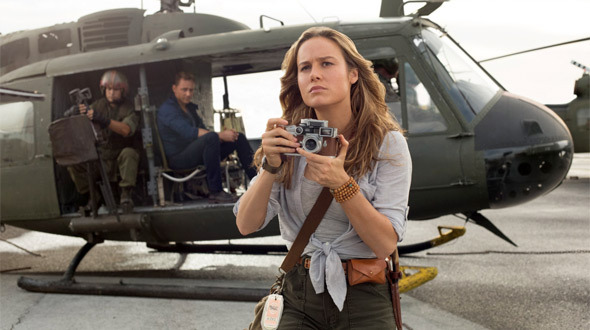 With energetic pacing and breathtaking visuals the film satisfies on the typical levels, but Skull Island also drops in a bit of weirdness that easily sets it apart from modern monster movies. For instance the setting detours from the classic, Kong tale. Set in 1973, Skull Island takes place during the final days of the Vietnam war, troops in Southeast Asia already planning the return to their homeland. That ends up not being the case for a particular squadron of soldiers, though, as they've just been given one, last mission. Led by Colonel Packard (Samuel L. Jackson), the squad is to helicopter a group of explorers to an uncharted island. In charge of the expedition is William Randa (John Goodman), a high-level official of the Monarch organization and a man who believes this mysterious island holds countless and ancient wonders that could be beneficial to the US' placement in the world. Also along for the ride is a former pilot for the British SAS turned tracker/mercenary (Tom Hiddleston) and a photojournalist (Brie Larson). What the expedition discovers on Skull Island is anything but what they're expecting, though, as the squad of helicopters quickly becomes scrap metal when immediately faced with the 100-ft tall beast. The survivors, armed but completely out of their element, must travel through the jungle of Skull Island encountering all manner of strange and ancient creature all the while knowing the king of the island, Kong, could be just around the corner. And that isn't even getting into the terrifying things lurking under the island's surface. Though it didn't work as well as expected for the first King Kong remake in 1976, transplanting the story to a different time is one of the nice ways it's all kept fresh in Skull Island. Having the humans who encounter the dangers of the island be American troops completely opens the doorway for the adventure level and action that takes place within. Vogt-Roberts keeps the pacing of the film at a constant high with plenty of opportunities being met to flesh out the human characters along the way. They're never quite as interesting as the eponymous giant at the center of the story, but that is to be the case any time there's a new King Kong adventure to be told. The director and his team of screenwriters here do an amazing job developing the island and its inhabitants. Even though it isn't exactly a new location for this series, the creatures found there are ripe with potential, something the filmmakers of Skull Island never let slip by as a missed opportunity. Around ever rocky cliff and cluster of trees lies another creature that is often as creative as it is terrifying, the latter element having a heavy hand in Skull Island's ability to keep those endless thrills at a horrifying level. Luckily Vogt-Roberts' handling of tone is superb, and the film ends up having you cringe in your seat with as much effortless ability as it has you losing control from laughter. This also gives the film a strong edge in handling the absurdity of it all, something else that clearly doesn't escape the director's vision. Vogt-Roberts injects that shot of adrenaline into Kong's universe, but he does so with an added drip of the strange and unbelievable. It's the strangeness that has you amped for Jackson's Captain Ahab level of obsession or Goodman's abilities as the creepy businessman. Vogt-Roberts flashes the inspirations for his film with the subtlety of… well, a 100-ft gorilla, but each one is more satisfyingly perfect than the last. He's the first filmmaker to work a visual reference to Cannibal Holocaust into a blockbuster epic, and there has to be some level of admiration for that alone. Nearly everyone in the cast appears to be on the same level as their director in terms of big-budget lunacy, Hiddleston and Larson as the leads notwithstanding. It isn't that they each give bad performances here. Far from it. It's just that the straight nature of their lead characters makes the eccentricities of the secondary performances stand out all the more. Jackson and Goodman are both superbly comical here, each delivering a performance that is foreboding and over the top. Elsewhere in the cast we find Shea Whigham as a Captain in the squad, the actor giving his war-time clichés a breath of nuanced, fresh air. Riding highest among the cast is John C. Reilly, though, as a World War II pilot who has been stranded on the island for nearly 30 years. The comic actor gives his character a nice brush of hilarity with each, delivered line, and he ends up personifying Skull Island's attitude best. With heaps of over-the-top visuals and breathtaking excitement, Skull Island is yet another impressive depiction of King Kong and his dangerous home. Thankfully, director Jordan Vogt-Roberts isn't satisfied with only that, and his entry into the Kong franchise is all the more memorable due to its own eccentricities. Such a breath of fresh air is needed in this day and age of endless epics with gigantic, digital creations interacting with awesomely detailed environments. Kong: Skull Island offers a boat-load of fun for die-hard fans of classic, monster movies of old while still remaining effortlessly fresh for those same fans. It's exactly what's needed for the modern blockbuster.